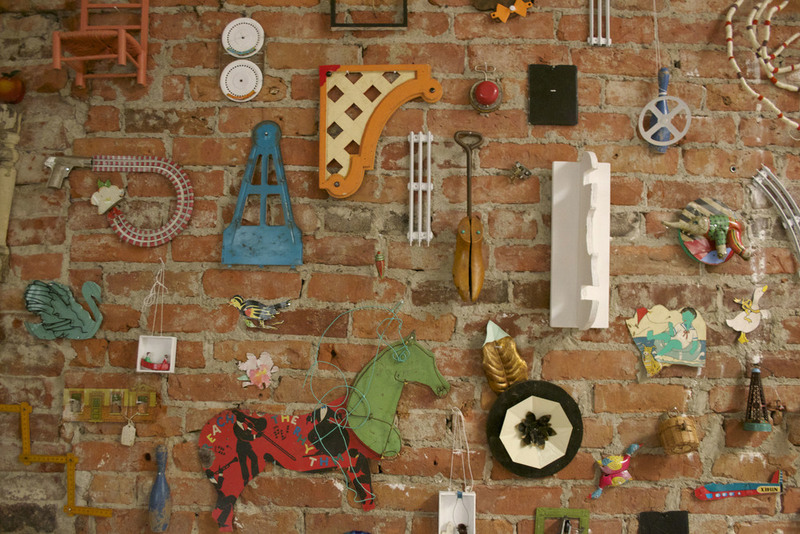 This Thursday, December 3rd from 6-10 pm you can view the full installation of Object Wall (137 Parts). It is currently on display in Suite 213 of 57' Biscayne Artist Studios located on the corner of First and Cherry St in Seattle, WA as part of the December Open House. This installation consists of a wall chronicling the "American Dream" through carefully crafted and curated artifacts. This collection of objects recounts the narratives and voices of their owners and owner's owners through symbols and metaphors. Toys and domestic ephemera are the analogies to achievements and opportunities; the material evidence of the search for fuller, richer and better lives. The cracks and creases, stains and rust wear their age, emitting clues of a past life and insight into a different time or place. Nostalgia lives along the train tracks that hang broken in parts, without a train in sight and atop the mini whicker chairs that remain stacked and with empty seats. There is a hum of noise that is imagined in the clutter, yet the musical instruments remain disassembled, unable to make an audible noise. Miniature woven baskets hang empty and gears from broken machine parts are painted still. These objects are the windows into the past where our imagination can wonder. You can glance inside the frame and then through the dollhouse window, but you cannot see the room inside. It takes a certain curiosity to find the hidden room with the patterned wallpaper and the grandfather clock ticking every hour, on the hour in the corner adjacent to the piano where the lessons are practiced. This wall of collected artifacts from hidden rooms and secret memories shares the histories of American dreamers; the picket fences and the reddest of roses. Visit the 57' Biscayne Artist Studios site or the December Open Studio event page for additional information.